A lot of time and effort has gone into the planning of every manifold we make. I started by making manifolds for all of my own vehicles, to make sure they are dependable and made comparable in performance to any other manifold on the market. If you purchase a manifold and have any problem with warping, cracking or bending, I will replace it FREE and cover shipping both ways. That is how certain I am that if you buy one of my custom manifolds it will be the last one you will ever have to buy for that vehicle's life. All the manifolds we make are fitted to a mock-up engine, with a real turbocharger (per your specifications) being fitted to the manifold at the same time. In this way, we can ensure visually that the manifold will work for your needs, BEFORE we ship it to you. This is just an extra step we take, so that you are completely satisfied when the manifold arrives at your door. 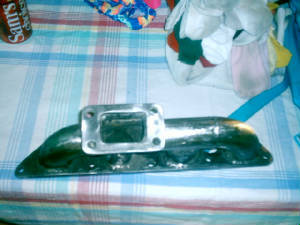 The partly finished manifold to the right is for a 2 L. F-series Honda. On the F22B Honda engine, the two center ports (of cylinders #2 and #3) are very close to each other, and Tee-style piping will not fit. This is where the time-consuming "labor of love" comes into our custom production work. A straight piece is used on the two center ports, connecting them to the log. Every engine has a specific location of the exhaust ports and attaching studs on the cylinder head, but they all look similar to each other in design. 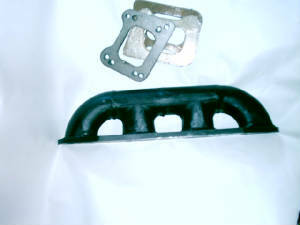 The most commonly used manifold design is the LOG style. This is self-explanatory, because it resembles a log in appearance. 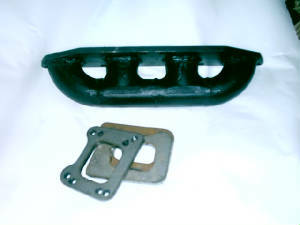 We fabricate a log manifold to adapt your preferred turbocharger to your engine’s cylinder head. Turbo exhaust manifolds are commercially available for popular vehicles and engines, usually at high-profit prices. 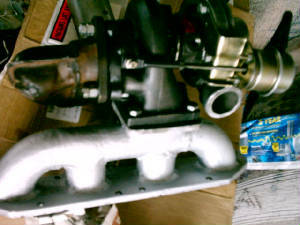 Now, if you have an engine for which there is no turbo manifold available, or, is way out of your price range, you have a couple choices: (i) one is to make your own, or (ii) order one of our turbo manifolds. If you have the interest, enthusiasm and ability to fabricate your own, you’re probably not reading this anyway! For the rest of us, at $199.99 plus shipping to your door, made how you want it, with our unbeatable guarantee, how can you go wrong? We do not believe you can get this type of product and service anywhere else! Just give us a call. We have experienced your frustration in not being able to purchase the correct turbo manifold for your engine/vehicle combination! We care about what you need! So please give us a chance to serve you properly. We intend to respond to your order in a timely manner. We don’t like waiting an unreasonable time for products and services, and don’t think that you should be either. Sure, every now and again delays occur, but we have designed our turbo manifold production to minimize the turnaround time for your specific manifold. 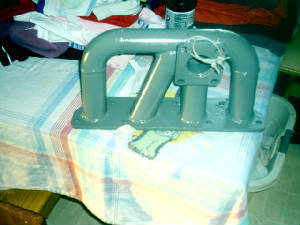 Most of the different turbo flanges and (pre-made) log manifolds are in stock. Usually we can reduce our shop time to several hours in fabricating YOUR turbo manifold, instead of days or weeks. Your flange is attached to your log manifold and then properly cleaned with sandblasting for a final surface that is pleasing, clean and safe. In this way we can be shipping your turbo manifold out to you in the same time our competitors would be still wondering about the best way to make a big profit! 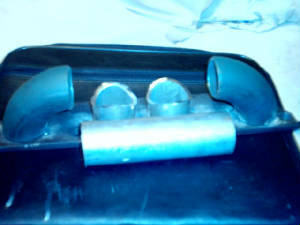 These two manifolds pictured above and below are for single (SOHC) and twin cam (DOHC) Neon engines 420A. They also fit the 2nd generation Eclipse, Dodge Stratus/Breeze/Avenger & PT Cruiser. 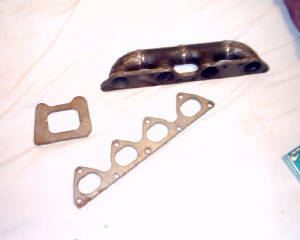 Whatever Mopar makes with the 420A engine, these will fit perfectly! 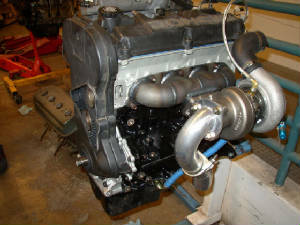 We can even make turbo manifolds to fit the Hybrid - Neon (2.4 L. DOHC)/2.2-2.5 Turbo Dodge common blocks! We are also offering manifolds for the new Lancer non-turbo OZ Rally engines! All turbochargers need oil for lubrication. This will have to be supplied from engine oiling system. All engines have access to an external oil fitting witch is usually found at the location of the oil pressure sending switch (where at least one wire is attached to a terminal). Locate this sender unit and carefully unscrew it from the engine block. This will be your reference for an adapter piece. Take it with you to your local parts store for a model to purchase brass fittings to fabricate a "Tee". This will allow you to connect one side of the T to the engine where you removed the sending unit. Also you want to be able to reinstall the sending unit so the oil warning system or gauge still operates properly. With the third side of the "Tee", you will have a pressurized oil supply for your new turbocharger. You can now run an oil supply line (usually 5/16 inch) from the "Tee"source to the turbo (bearings). Cleanliness is very important as you don’t want ANY contaminants to destroy the bearings of your turbo. 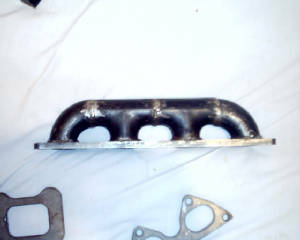 Next you will need to remove the oil pan so a return (drain) line can be installed into it. This can be done two ways: (i) one is after the pan has been removed, locate a point on the upper part of the oil pan near the mating surface where the pan meets the engine block (so the return tube is ABOVE the oil level, when the pan is full). Then drill a hole about 1/2 in diameter and weld in a piece of steel tube. 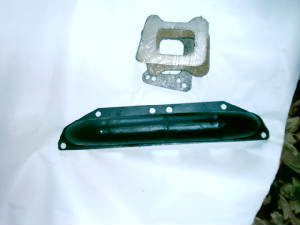 This will be the connection for the oil return (drain). It is wise to test the welded area before you reinstall the oil pan. (ii) The second way is prepare a steel plate drilled with three holes, one for a welded pipe, and two for attaching bolts. Weld a piece of steel pipe of the correct diameter to the middle hole of the steel plate. 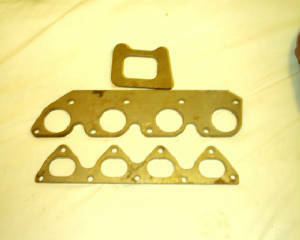 To attach it to the oil pan, drill the same three holes in the oil pan. Prepare a gasket (cut out of off-the-shelf gasket material that you can buy at any auto parts supplier), or put silicone, between the plate and pan. After you have securely attached the drain tube, test the connection for leaks before you reinstall the oil pan. This way, you are sure it will not leak and you will not have to remove the oil pan again. If your turbo needs coolant, this can easily be achieved by cutting off a few inches in the center section of your heater hoses, then assemble two "Tee"s out of off-the-shelf steel pipe from your local hardware store. I found that 3/8 or 1/4 in pipe will work nicely. 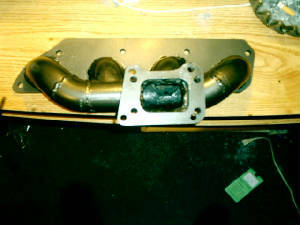 After you have installed the two "Tee"s then simply connect each remaining part of the Tee, from each of the two heater hoses, to each side of the turbo (one side to one and the other side to the remaining open connection). This is a simple and effective way to supply coolant to your turbocharger. 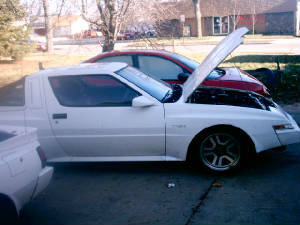 In the next section we will discuss HOW TO MAKE YOUR OWN HOMEMADE TURBO KIT! 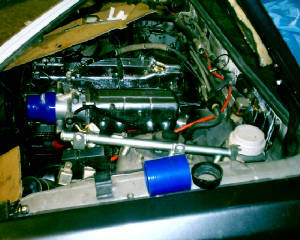 HOME MADE TURBO KIT !